Regal Princess utilizes modern technology in order to provide a flawless cruise experience. Regal Princess is the debut ship of Princess’ innovative Ocean Medallion Class. A cruise on board begins with a medallion, given to all guests which allows access to staterooms. The aim of the Ocean Medallion class is to provide you with a customized cruise experience. With the help of technology, guests are offered the most personal and efficient service possible. Guests can use innovative services such as the “Here & Now” service to order drinks, snacks and more. “Ocean Concierge” allows users to make a profile and set preferences so that the crew on board Regal Princess can send personalized invitations for events and offer the most tailored service yet. 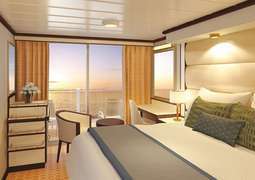 On board guests can expect to find a wide variety of spacious cabins, ranging from inside cabins with all of the necessary amenities, to luxurious suites with spacious verandas and stunning ocean views. As with all Princess cruises, guests are provided with a host of dining options, presenting continental cuisine the choice is all yours. 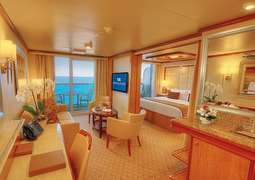 Accommodation on board the Regal Princess consists of Inside, Balcony, Deluxe Balcony Cabins, Mini-Suites and Suites. 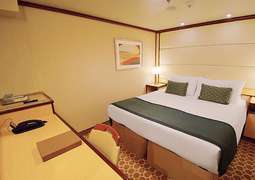 Every room features modern amenities to give you the most comfortable and problem-free cruise possible. Facilities include refrigerators, wardrobes and televisions, along with complimentary 24-hour room service. Balcony Cabins are perfect for incredible ocean views. On board the Regal Princess you will be subjected to the most unbelievable dining experience with delectable meals created using only fresh, quality ingredients. There are exciting new eateries - from private dining opportunities at the Chef's Table Lumiere, to exciting specialty restaurants like 'Crown Grill' and 'Sabatini's' plus a diverse selection of casual dining options serving hand-tossed Neapolitan-style pizza, flambes, fresh gelato and tapas. Discover exciting new entertainment offerings - live music and stunning choreography at fantastic and well-equipped venues. The Regal Princess boasts a 'Movies Under the Stars' screen making watching first-runs even more exciting. Sophisticated architectural lighting at the Princess Theatre and the side-splitting humour of the late night comedy shows at the 'Princess Live!' will be your evening's highlights. Numerous lounges on board the Regal Princess will offer comfort and relaxation. Designed with a range of activity levels in mind, Regal Princess' sports and fitness options allow you to stick to your regular training programme or learn an engaging new activity on board. Practice your swing at the 'Golf Swing Area', join a class at the aerobics studio or get exercise with a view at the outdoor exercise circuit. Regal Princess is also your haven for relaxation, whether you’re taking a dip in the fresh water pools and hot tubs on the top deck or rejuvenating your mind and body in the 'Lotus Spa'. For all the best deals on the Regal Princess from Princess Cruises Australia call our cruise experts on 1300 887 590.